Nestled in the heart of Birnam, and neighbouring the village of Dunkeld, this beautiful one bedroom ground floor apartment accommodates up to four guests. Dogs welcome. This grade 2 listed apartment, which is situated within Birnam’s conservation area, is freshly decorated and furnished in a modern style. With luxurious beds available as 2 singles or 1 super king plus a sofa bed in the living room which can accommodate an additional 1 or 2 guests. The apartment is set off the main road in a quiet area however the main street in Birnam is just a 2 minute walk with the popular tourist village of Dunkeld a short 15 minute walk. The property is ideal for a getaway break and a sightseeing base. 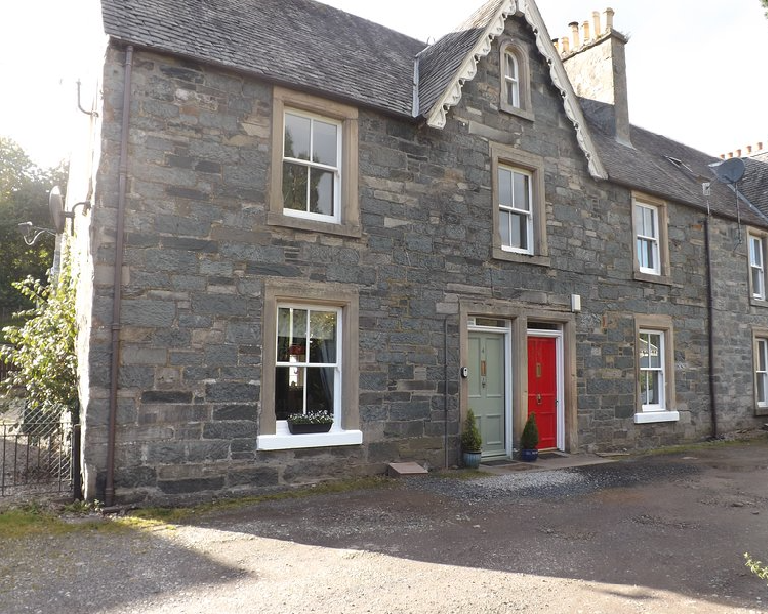 Only a short walk from local amenities and the picturesque village of Dunkeld this holiday home is in an ideal location. The historic villages of Birnam and Dunkeld merge into each other and offer visitors, who love the outdoors and country pursuits, an area of Perthshire rich in places to visit and explore. Locally, there is the medieval Dunkeld Cathedral with its peaceful riverside garden, the Beatrix Potter Gardens and Museum for children, riverside walks and interesting little shops, galleries and cafes in the historic town of Dunkeld. There is a range of marked riverside and forestry walks in this beautiful area of Perthshire and various tracks for cycling. If your interest is bird watching there is the Loch of the Lowes where ospreys come to breed. A Citylink Coach Service stops in Birnam whilst Dunkeld & Birnam Train Station is only a 400 meter walk. There's also free parking available right outside the property. Well behaved dogs are permitted. However we would ask that they’re not allowed onto the beds or furniture. We live 10 minutes away in the village of Bankfoot. We can be contacted for any queries, and we’re available for call out in case of emergency. Keys are left in a key safe and we don’t generally do meet and greets unless requested. Please note:- The accommodation has level access with wood/vinyl flooring throughout however it is not suitable for wheelchairs. As well as offering a delicious lunch, the nearby Birnam Arts and Conference Centre is an attractive little theatre which hosts well known musical entertainers from all over the world. There is also a good selection of pubs and restaurants to choose from in the area. Please visit our Dunkeld & Birnam Local Area page for further details.